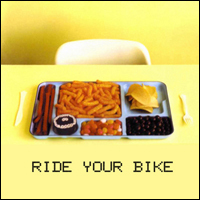 Don't let the album cover of Ride Your Bike's The Connection turn you off. Unlike the food on the cover, this six song EP isn't junk. The band packs a gritty indie-rock sound in the vein of early The Get Up Kids, but that sound wouldn't be expected after a listen of the title track. Vocalist Mike Getches sounds almost like Leighton from Lydia at times, with backing strings used to squeeze the emotion out of the rest of the music. However, this mellow track doesn't represent the rest of the album at all. "Coat Rack" is a perfect model of the band's sound, with driving guitar riffs surrounding the nasally, yet powerful vocals. Getches shows off his surprising range, going from low notes to highs in a matter of a couple notes. "Firefly" may not be a Saves The Day cover, but it could easily have been done by the band. Though the vocals may not be as unique as Chris Conley's, but they go much better with the style of music. Closer "Time We Took Those Chances" shows the band at its peak ability of song writing, lyrically honest words surrounded by some of the strongest musical ability on the entire EP. Chants fill the backgrounds of the chorus with life, igniting the song to even higher heights. The band's somewhat silly name, combined with the absolutely outrageous album cover makes the band seem almost like a joke. Through one listen of the band, it's obvious that the band is dead serious about what they do, which is make great music. Check the band out on their Deep Elm page here.